After a clean sweep of wins for all of their teams last week, Hemel Town repeated the feat this weekend, with the sides all now hovering around the promotion or play-off positions with just four games of the season to go. 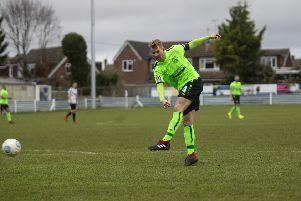 There was another victory for Hemel’s first team that keeps them up in third place in the Saracens Hertfordshire Championship, and just one point off second-placed Ampthill Town. Batting first at Hemel’s Heath Park ground , Reed opened their batting to the start of Steve Reader, who remarkably snaffled up the first four wickets in his first five overs. Reader finished with 4-11 from seven overs and after 10 overs Reed were on a meagre 23-4. But then came a partnership of 62 between Reed skipper Tom Greaves (38) and Stuart Smith (31). But that was as far as a comeback went, as Hemel’s bowling resources meant that a combination of Lewis Hodgins (2-25) , Parth Mehta (2-24) and Johan Maritz (1-16) left Reed dismissed for 144 in 41 overs. Hemel went after the runs like a one-day match. Hemish Ilangaratne (26) and Johan Maritz (17) rattled off 43 in the first five overs but then two wickets fell at 43 and another two at the score of 55 after nine overs. Ed Langley did his bit with 17 runs in an hour. In the end, Shidhu Kanade could come in at number nine and smack a quick undefeated 13 as Hemel reached 148-7 in 40 overs to see the game out by 5.30pm. Hemel’s second team had Saturday off as scheduled opponents St Albans West Indians have now pulled out of the Saracens Hertfordshire League Division 3B. Hemel’s third XI put paid to their first league defeat of the season – back in early June – to Bushey II by trouncing them at home in the reverse fixture. Skipper Graham Clark led the way with 79 and his loyal sidekick Bryan Davies added 84. That was bolstered by a quick-fire 31 from Charlie Hoskins down the order as Hemel reached 264-7 in their 50 overs. Hemel had the bowling power as well, with Bryan Davies chipping in with 3-32, Sunny Kullar with 3-40 and Ed Grayson 2-33. Bushey were all out for 179, to give a 85-run victory for the hosts. They remain in second place in Division 6B with the end-of-season home game against league leaders Abbots Langley II now just four games away. It was a bit of a wasted journey up to Hitchin for Hemel’s fourth team match with Preston III as the game lasted less than 16 overs. Hemel tore through Preston’s batters to remove them for just 23 runs in 11.1 overs. There were three wickets each for Nic Benson (3-2), Maryn Bell (3-6) and Dil Khan (3-14). In the reply, they then needed just 4.1 overs for Mike Samuels (23 not out) to tap off the runs. Hemel remain in fourth place in Division 9B. Their next two games are at home to Old Minchendenians, who are in second place in the league, and away to Sandridge II, who are in third. On Sunday, Hemel’s Sunday first XI came out on top fairly convincingly against Boxmoor. Batting first, Boxmoor started off quite well with Hemel setting aggressive fields. Under-16s player Ben Mannering scored 42 to be the Boxmoor leading batsman. On the Hemel bowling front, Anjam Khan led the way with 3-27 and there were a couple of wickets each for Charlie Hoskins (2-27) and Matt Scears (2-56). Boxmoor were 229 all out to set a target to get for Hemel. The experience of skipper Lewis Hodgins came to the fore as he retired himself having scored 101. Ed Langley helped himself to an undefeated 50 and Charlie Hoskins hit an unbeaten 34, as Hemel cruised in with 235 runs after 25 overs.